Federal lawmakers pressured President Obama this week to take executive action to reform marijuana policy. Meanwhile, state legislative reforms are still moving forward throughout the country. Keep reading to get the latest news and to learn what you can do to take action. Fourteen members of the U.S. House of Representatives sent a letter this week to President Obama urging the administration to enact various marijuana law reforms. The letter requests the administration to reschedule marijuana under federal law to Schedule III or a lower category, or to deschedule it altogether; to license additional growers of cannabis for research purposes; to extend protections for secondary and tertiary businesses that serve the medical marijuana industry, and to ensure that the Justice Department better respects Congressionally-enacted legislation preventing it from interfering with well-regulated state medical cannabis programs. California: The Public Policy Institute of California released new polling information Thursday showing “broad and increasing support for a legal, regulated system of adult-use marijuana in California.” The Adult Use of Marijuana Act (AUMA), which is expected to appear on the November ballot, permits adults to legally grow (up to six plants) and possess personal use quantities of cannabis (up to one ounce of flower and/or up to eight grams of concentrate) while also licensing commercial cannabis production and retail sales. The measure prohibits localities from taking actions to infringe upon adults’ ability to possession and cultivate cannabis for non-commercial purposes. Sixty-nine percent of Democrats, 65 percent of independents and 45 percent of Republicans support regulating the adult use of marijuana, according to the poll, In each demographic, support has increased in recent months. National NORML has endorsed the AUMA, along with California Lieutenant Governor Gavin Newsom, U.S. Reps. Ted Lieu and Dana Rohrabacher, the California Council of Land Trusts, the Drug Policy Alliance, the Marijuana Policy Project, the California Cannabis Industry Association, the California Medical Association, and the California NAACP. Ohio: Lawmakers in both chambers have approved legislation, House bill 523, to regulate the use of medical cannabis preparations by qualified patients. The bill authorizes the use of various forms of cannabis preparations for the physicians-authorized treatment of nearly two-dozen conditions, including chronic pain, epilepsy, and Crohn’s. It calls on the state to license the production, distribution, and testing of cannabis products. Home cultivation is not allowed. Products may be dispensed as oils, tinctures, edibles, patches, or as plant material. However, smoking herbal cannabis is not permitted under the measure. Vaporizing medical cannabis products is permitted. Similar restrictions exist in three other states: Minnesota, New York, and Pennsylvania. The measure now awaits action from Gov. John Kasich, who may be contacted here. West Virginia: Legislation was recently introduced to decriminalize the possession and cultivation of limited quantities of marijuana in West Virginia. House Bill 114 permits the personal use, growth and possession of up to two ounces of marijuana by persons over the age of twenty-one who have acquired a “tax stamp” from the state. It removes marijuana from the state list of schedule I drugs and decriminalizes first-time marijuana distribution offenses involving under 30 grams of marijuana. Adults will be allowed to transfer to another person twenty-one years of age or older, without remuneration, one ounce or less of marijuana. [Editor’s note: Along with signing the below White House petition encouraging the president to grant clemency to these federal prisoners with life sentences for cannabis-only related offenses, please take a moment to do something even more important and write letters of support to the clemency petition to both the President (1600 Pennsylvania, NW, Washington, DC, 20500-0004) and the Office of Pardon Attorney (1425 New York Ave., NW, Suite 1100, Washington, DC 20530) asking for immediate commutation of these prisoners’ sentences. Cannabis Prohibition is ending in America (and likely soon around the world too). It is not going to end without prolonged legal, political and regulatory battles. This is well known and anticipated by reformers. Social justice movements take decades to build up credibility, social impetus and political saliency. There are, necessarily, many angles by which cannabis prohibition laws can be assaulted: legislation, binding voter initiatives and impact litigation. To wit, 1) there are over 750,000 annual cannabis arrests (90% for possession-only) that generate many tens of thousands of cannabis-only offenders sent to jail or prison, and 2) these five men are serving lifetime sentences, for a product that is no longer contraband in two states, decriminalized in fourteen states and eighteen states (and the District of Columbia) now have medical cannabis laws (with six states allowing commercial retail access to the herb with a physician’s recommendation). This federal petition to release these men back to their loving families and to get off the tax roll is born out of the non-profit organization called Life For Pot (where the groups is tracking at least twenty prisoners serving life sentences for cannabis-only related offenses), the heart felt project of volunteer Beth Curtis. Mr. Obama indicated to ABC News that ‘he has bigger fish to fry’ when asked about what if anything the feds are going to regarding Colorado and Washington voters recently approving cannabis legalization measures. Whether the president is going to expend any political capital at all in actually advancing cannabis law reforms in his last four years remains to be seen, but, the man should act post haste, giving a nod to the new legal era America has entered regarding cannabis prohibition, on this well researched and written petition by granting clemency to these former and now elderly pot cultivators and smugglers. We can all help place greater public focus and attention on this federal petition by letting the White House know that President Obama should ‘do the right thing’ and pardon these lifetime prisoners for growing and supplying cannabis to a willing and wonting population of cannabis consumers while unpopular (and largely unenforceable) prohibition laws were still in place. Please help Mr. Kennedy’s petition for clemency, Beth’s life’s work and these five cannabis prisoners by signing the White House petition to act favorably upon it. You can review the petition here. 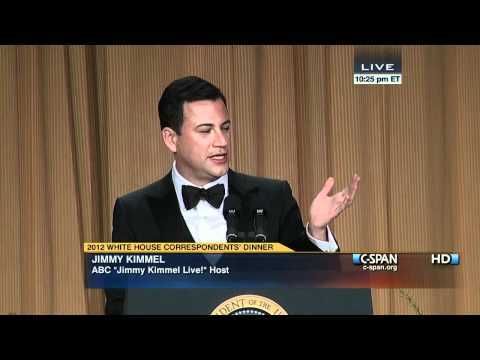 Late night comedian Jimmy Kimmel performed at the White House Correspondents’ Dinner and took a moment to confront President Obama on his marijuana crackdown. I do have one real question for you, Mr. President. What’s with the marijuana crackdown? I mean, seriously, what’s the concern, we will deplete the nation’s Funyun supply? You know, pot smokers vote, too. Sometimes a week after the election, but they vote. Let’s take a quick poll. I would like everyone in this room to raise your hand if you’ve never smoked pot. Raise your hands if you've never smoked pot. [Very few hands go up.] Heh heh. There you go. Look at Brit Hume – he’s high right now. He’s on his fourth almond macaroon. Mr. President, I hope you don’t think I’m out of line here, but marijuana is something that real people care about. The fact that you believe Speaker Boehner when he tells you he still has control of his party leads me to believe that you must be smoking some crazy great weed yourself. Woody Harrelson just woke up. Thank you, Jimmy Kimmel, for exemplifying how a cannabis consumer can be polite yet direct in calling on the president to explain a policy that is no longer supported by a majority of Americans. Half of this country supports outright legalization of marijuana and three-quarters think marijuana punishments, if any, should be no more than ticketable offenses, not crimes. “What I specifically said was that we were not going to prioritize prosecutions of persons who are using medical marijuana. I never made a commitment that somehow we were going to give carte blanche to large-scale producers and operators of marijuana – and the reason is, because it’s against federal law. I can’t nullify congressional law,” Obama said. “I can’t ask the Justice Department to say, ‘Ignore completely a federal law that’s on the books.’ What I can say is, ‘Use your prosecutorial discretion and properly prioritize your resources to go after things that are really doing folks damage.’ As a consequence, there haven’t been prosecutions of users of marijuana for medical purposes,” Obama said.